The goal of this program is to introduce (or re-introduce) students to their local public library and to provide a library card for every grade 4 student in Mississauga. 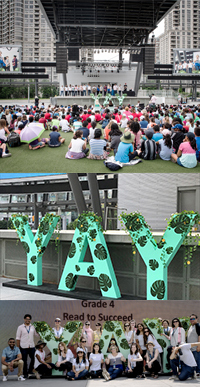 By visiting the library with their class and joining the Grade 4 Read to Succeed Program, students are encouraged to read for pleasure throughout the year. Your local library has designed a fun and energetic program that will be sure to ignite the joy of reading and to motivate students to visit the library on a regular basis. At the end of the school year, there is an annual celebratory event for those classes with the highest participation rates across the City! If you are a teacher and would like to book your Grade 4 Read to Succeed class visit, please contact the Mississauga Library location nearest you (check the Library/School Partner List found here). If you have any other questions, please contact the Children’s Department, Central Library at (905) 615-3500 x 3512 or Children.Library@mississauga.ca. The Library thanks the Friends of the Mississauga Library System for providing FREE bus trips for all grade 4 classes in Mississauga so that everyone can benefit from the Grade 4 Read to Succeed Program throughout the school year.